Beehive: Should kids earn their money? Should kids earn their money? This post was definitely sparkled while I was reading some comments on Facebook and realized most parents there were wrong. Now, I'm not a parent so you could say not to get involved in this and also who am I to give advice on parenting... However, I'm closer to being a kid than adult. I also know how I was raised and how would I act or feel if it was any different. 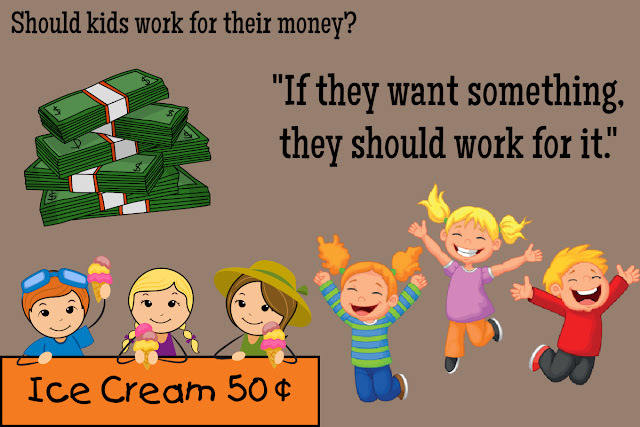 The first issue was: Should kids work and earn their money? Of course, we're talking about some yard sales, cookie sales, selling their drawings, painting someone's fence or clearing out the neighbor's garage; we're not talking about actual jobs. While parents think it should teach kids how to value money, I think it just takes away from them being kids. If, for example, a kid loves to draw, trying to sell those paintings is not a bad idea, but it could put a pressure at the kid and that's never good. Also, all of their friends would be in a park playing and this poor kid would be sorting old stuff in a garage. "If they want something, they should work for it." shouldn't start before high school. Or later. Another thing I saw was: I pay my kid to do some chores. Again, same as the above, I think this takes away from them being just kids, but this case is a bit different. Teaching kids they should help around is a good thing and giving them small tasks shouldn't be too difficult, but paying them for it is also wrong in my opinion. If it's about household chores, they should do it without getting payed. They're a part of the family too and everybody should contribute to chores. Nobody is going to pay these kids for doing chores when they grow up, so I think they would be pretty disappointed in how life works when you grow up. They'll have enough time to be stressed out and worry about money. My point is: let the kids be the kids. Just that. I'm looking at myself and my childhood. I never got paid for anything I did around the house. To be honest, I didn't do much, almost anything, cause my mom wanted us to enjoy the play as much as my brother and I could. As we grew up she asked us to go to the store or take the trash out and we did it. No struggle, no payment. I don't know how things would turn up if it was any different in our house, but from today's point of view, I think I would resent my parents for making me think I had to bring money in the household when I was still learning basic math and how to write. If you want your kid to help you with something, just ask nicely and try to make it fun. Parents decide to have a baby or not to have one. If you do have one, or two or ten, it's your responsibility to take care of them. They shouldn't earn money for themselves at the age of 10. There's a whole life in head of them, they'll, unless they have super rich parents, have the chance to experience all kinds of money struggles and stress in general. Childhood is the only time when they can still believe in the good, that people are nice and mean well, that everything is unicorns and rainbows. Don't ruin it for them. If you can make it fun, like selling lemonade with their friends every once in a while, that's what I'd call acceptable. They need to have their friends and fun beside them. What are your thoughts? Are you a parent? If yes, how do you deal with this topic? I'm more than my social media.